Go on an ocean adventure with the kids using our Ocean themed word scramble activity. The words scrambled on the worksheet are pretty common, but if you get stuck scroll down to the bottom of the page for the answer key. 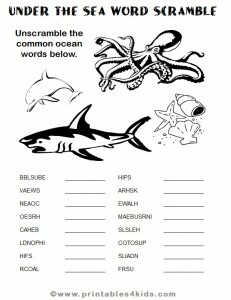 Use the ocean word scramble for a supplemental activity for science class, as a printable game at an Under The Sea Birthday Party, or for anyday! Click on the image below to view and print the word scramble full size. For more fun, check out our Mermaid coloring page, Pirate color-by-number or Pirate word search.